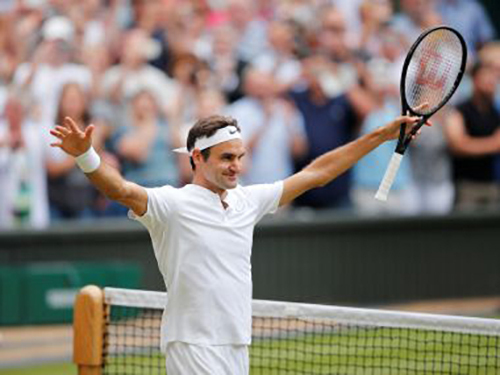 In 2017, Roger Federer, the greatest tennis player of all time, took an unprecedented leave of absence from the professional tennis tour to rest his soon-to-be 36 year old body and rejuvenate his mind. Federer said, “After playing for almost twenty years, all of a sudden you realize, I think this body, and maybe the mind, deserves a break”. I would like to explore Roger Federer’s philosophy of taking a break in the context of the biblical tradition of the Sabbath. Sabbath is first mentioned in the Torah in Genesis (2:3) when God rested on the seventh day after creating heaven and earth. As Heschel wrote, “It is, indeed, a unique occasion at which the distinguished word qadosh is used for the first time: in the Book of Genesis at the end of the story of creation. How extremely significant is the fact that it is applied to time: “And God blessed the seventh day and made it holy.” There is no reference in the record of creation to any object in space that would be endowed with the quality of holiness.” Even God needed a time to rest and reflect. The Israelites first experienced Sabbath in Exodus (16:23) while wandering in the wilderness after fleeing slavery in Egypt. God fortified the Israelites by providing manna for sustenance and Sabbath for sacred sanctity. Sabbath is described as sacred time in Leviticus (23:3). So how does the biblical connection of Sabbath relate to Roger Federer in 2017? To understand the connection, I will provide a bit of background. Roger Federer is acknowledged as the greatest tennis player of all time. From 2003-2015, he won 17 grand slam titles, 90 percent of his matches, and made it to 10 straight grand slam finals. In addition, Federer holds the record for most consecutive semi-finals at a grand slam, 23, and most consecutive quarter-finals at a grand slam, 36. However, after his Wimbledon title in 2012, he went 19 grand slams without winning a title. He suffered his first major injury in 2016. The 2016 French Open was the first grand slam event he missed in his active career and ended a run of appearing in 65 consecutive grand slam tournaments. Some critics said that it was time for Roger Federer to retire. Had his best tennis passed him by? He even experimented with a new racquet and new coaches. The next day, Roger Federer announced that he would not play in the U.S. Open and, in fact, that he was not going to play the rest of the 2016 tennis season. Roger Federer was taking a 5-month break from competitive tennis. He wanted to rest his body, heal his knee, and rejuvenate his mind. Roger Federer announced his return to competitive tennis in January 2017 in time for the Australian Open. In January 2017, I ruptured my left Achilles for the second time and had reconstructive surgery. My doctor put me on 40 days of bed rest (Reflections Between Passover and Shavuot: What can you learn from wandering in the wilderness for 40 years (or 40 days)?). While lying in bed recovering, I was inspired by Roger Federer’s comeback at the Australian open. 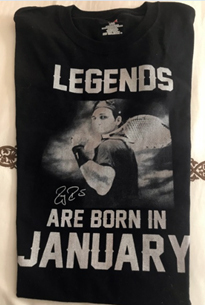 I even bought a tee shirt (pictured below) which stated that “champions are born in January” (my birthday is in January). Roger Federer’s recovery inspired me during my recovery from injury. In an unprecedented run, Roger actually won the Australian Open soundly defeating his arch rival, Rafael Nadal, in the finals. Roger went on to win his next two tennis tournaments in the U.S. at Indian Wells, CA and Miami, FL, defeating Nadal in both. Roger Federer was having one of his greatest tennis seasons and was on course to regain the number 1 world ranking as the oldest player to achieve this ranking. What did Roger Federer promptly do after winning the Miami tournament? He suddenly announced another personal Sabbath, taking off the entire clay court season, including the French Open. This second pause in his active schedule was unparalleled. Nevertheless, or as a direct result, he returned for the summer grass court season and won Halle Tournament in Germany and ultimately won Wimbledon for the unprecedented eighth time. While he lost in the U.S. Open in the quarter finals, he continued to play very well. Roger then took another break this fall. In October, he returned to competitive tennis to win the Shanghai Open while defeating Rafael Nadal in the finals, representing a fifth consecutive victory over his arch rival. This past weekend, Federer won his hometown tournament in Basel, Switzerland for the 8th time, giving him a tour-leading 7th tournament victory in 2017. Roger’s 2017 winning percentage is 93% which is the third best of his career. As Vladimir Horowitz, the world-class pianist, once said when he was asked how he played the music so much better than anyone else, he replied “it is not the music that I play better than anyone else, it is the pauses that I play better”. In today’s society, there is compelling conviction to strive to do anything and everything. We are overscheduled. We overdo. Our children are massively over programmed. Federer’s storybook season, “Roger Federer Is Still Rocking” written by Jason Gay in The Wall Street Journal on October 31, 2017. Jason Gay wrote a wonderful article “We need to relax like Roger Federer” in The Wall Street Journal on July 21, 2017. I also recommend My Jewish Learning “Shabbat Rest and Renewal” for additional exploration about the meaning of Shabbat. Time Magazine article, “Q&A: Roger Federer Talks to TIME About Nadal, That Win in Melbourne, and Partying Till Dawn” Sean Gregory, TIME Sports, Feb 02, 2017. Gregory, Sean. “Q&A: Roger Federer Talks to TIME About Nadal, That Win in Melbourne, and Partying Till Dawn” TIME Sports, Feb 02, 2017.